Hall of the Mountain King: Metal Meltdowns: Quiet Riot, "QR III"
By 1986, Quiet Riot’s fortunes were definitely on the wane. Bassist Rudy Sarzo had left, to be replaced by Chuck Wright (Giuffria, Ted Nugent, House of Lords), and for QR III the band took a far more pop-oriented approach to the music than the previous two records. Let’s start with the good, and that’s the lead single “The Wild and the Young.” On an album of sub-par material, this tune shines. It’s a fantastic hard-rock anthem with one of those hooks that burrows into your head and gets stuck there. Sure, it’s a bit more polished than their previous work, but it’s still instantly recognizable as Quiet Riot, and I would argue that it’s one of their best songs. About the only track here that sounds like the band’s earlier, more raw work is “Put Up or Shut Up,” and I actually suspect this is a holdover from one of those other records. It seems to stick out on QR III as a raw rocker in a sea of quintessentially mid-1980s pop rock. Finally, “The Pump” was my favorite song on the record at the time, and it holds up pretty well these years later. It’s got a little bit of nastiness to it, and it has some tasty bass work from Wright. Beyond those few tracks, though, the album falters. As I revisit some of these records for this series, I find myself surprised in a good way. That’s not the case with QR III. In 1986, I was a complete Quiet Riot fanboy. They were my first favorite band and the reason that I became a lifelong metal fan. I admittedly didn’t like this record as well as the first two albums but, at the time, I thought the band could do no wrong. Looking at it 30 years later, there’s a lot of wrong. The rough edges from the previous albums had been ground down and polished. The synthesizers were often cranked louder than the guitars. All of the zaniness of songs like “Stomp Your Hands, Clap Your Feet” or “Party All Night” from Condition Critical had been stomped out in this largely uninteresting and dull collection. So many of the songs on QR III just simply cannot be separated from their era. “Slave to Love,” for example, just drips 1980s FM rock. “Helping Hands,” though it tries to rise to the level of something that say, Queen, was doing at the time, is really just that quasi-inspirational, quasi-charitable call to action that was so much lip service at the time. There are, naturally, a couple of ballads in “Twilight Hotel” and “Still of the Night.” The first is at least slightly interesting, if firmly rooted in its time period. The second, well, there’s not much to say about it. The album does occasionally approach Quiet Riot’s old style on songs like “Down and Dirty” and “Rise or Fall,” but even then, the synth really overpowers the raw energy of the tracks. 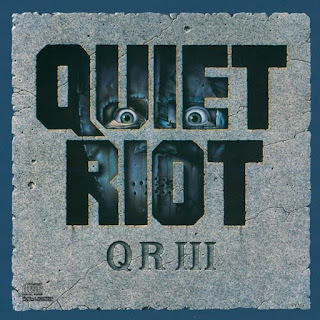 If we’re being honest, Quiet Riot was probably headed for obscurity before QR III was released, but this album certainly drove the nail in the coffin of the band’s career. By the band’s next release in 1988 (somewhat confusingly titled QR), singer Kevin DuBrow had been canned, to be replaced by Rough Cutt’s Paul Shortino, and Wright had left. The result was a record that sounded nothing at all like Quiet Riot. DuBrow would eventually return to the fold in the 1990s, and they even got the Metal Health-era lineup back together in the latter part of that decade. I managed to catch them live twice during that period, and both performances were energized and fantastic. But Quiet Riot never could recapture the recording magic. DuBrow would die of a cocaine overdose in 2007, effectively ending the strange and sad story of the band that brought metal to the mainstream, but never quite managed to reap the long-term rewards. Though a version of Quiet Riot continues to tour and record, the only remaining member from the Metal Health lineup is drummer Frankie Banali, and it’s not really the band that I remember and loved as a kid.